On January 9, 2003, the Richard Nixon Foundation awarded George Shultz with the Victory of Freedom Award, an award that honors outstanding leaders who have championed the cause of freedom and personify the 37th president’s principle of enlightened national interest in foreign and domestic policy. 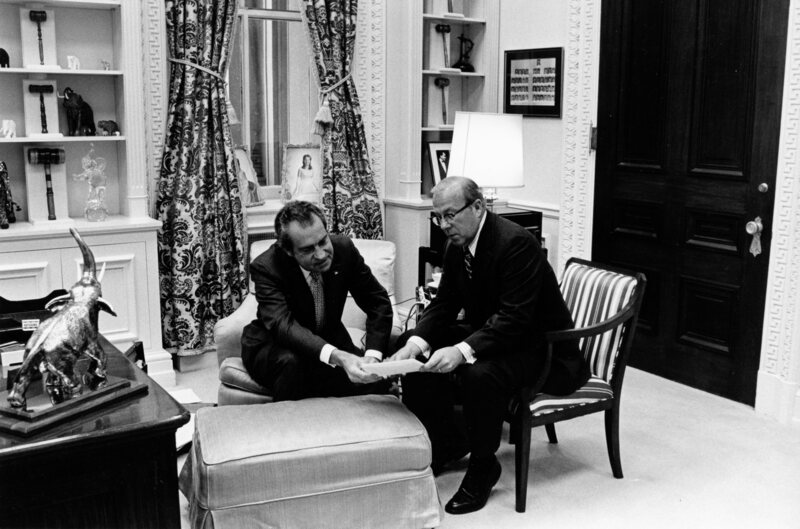 A perennial public servant, Shultz served first as the Secretary of Labor, the Director of the Office of Management and Budget, and the Secretary of the Treasury under President Nixon. Later on, under the Reagan administration, Shultz become the the 60th U.S. Secretary of State. Now, let me turn to the subject of the desegregation of the schools in the south. The Brown versus Topeka Board of Education, the decision by the Supreme Court in 1954, had declared dual school systems to be unconstitutional and ordered change to proceed with all deliberate speed. Yet here we were a decade and a half later, and the dual school system was still the rule throughout most of the south. The Supreme Court had ruled against further delay once more in October, 1969. The whole subject was intentionally controversial. Argument was super-heated. Tension was mounting. I don’t know if it’s possible, in your feeling, to take you back to those days and to realize how tense this was. In March 1970, President Nixon took his decision. He declared Brown versus Topeka Board of Education to be, and in his words, “Right in both constitutional and human terms,” and he expressed his intention to enforce the law. He also saw the importance of managing the traumatic process of transition. A cabinet committee was formed at his direction to work on the problem in a direct managerial way. Vice President Agnew was made the chairman, and I was then Secretary of Labor, was the vice-chairman. The challenge was to manage the transition to desegregated schools in the states most affected, Alabama, Arkansas, Georgia, Louisiana, Mississippi, North Carolina, and South Carolina. The vice president said he wanted no part of this effort and declined to participate in the committee’s deliberations. So I became the de facto chairman. I had strong help from presidential counselor Pat Moynihan, Special Counsel Leonard Garment, and Ed Morgan, a savvy former Advance Man for the President. We talked it all over carefully with the president, and with his support, we formed biracial committees in each of the seven states. The idea was to reach out to key leaders to persuade them to be part of the solution, not part of the problem. The president agreed that politics should have nothing to do with the selection of the members of these committees. We wanted people, black and white, who are strong and respected in their constituencies. Many were reluctant to serve. Reluctant to serve. The whites fearing to close an association with desegregation, the blacks’ concern that the committees might simply be a sham. First group to come to Washington was from Mississippi, considered to be the most difficult state. We met in the Roosevelt Room in the White House, right opposite to President’s Oval Office. The discussion was civil, but deep division was evident. Deep division. A lot them argue and get them out of their systems, about two hours. Then a point came in the meeting after about two hours, and this repeated itself with all of the subsequent states when I thought it was time to shift gears. So I had a little prearrangement with John Mitchell, who was standing by and he came in to our room. He was known throughout the south as a tough guy, and then who was regarded, as the white says, their man. When lunch time arrived, I took them over to the Diplomatic Reception Rooms in the State Department. I pointed out the desk that’s there. You probably all seen it, designed by Thomas Jefferson, in which he wrote parts of the Declaration of Independence dedicated to the proposition that all men are created equal. I sat with two strong men that I wanted to be the co-chairman of the Mississippi committee. Warren Hood, he was president of the Mississippi Manufacturers Association, and Dr. Gilbert Mason, a black physician, and head of the Biloxi chapter of the NAACP. I argued that if they would accept, the committee would have great credibility with blacks and whites. I can see they were beginning to talk constructively to each other. So I left them alone. One observer questioned this tactic, and I said, “I learned long ago that when parties get this close to agreement, it is best to let them complete their deal by themselves. That way, the agreement belongs to them. It’s theirs, and they’ll try everything they can to make it work.” So as lunch ended, these two tough, respective leaders shook hands on their own deal. We were in business, in what was regarded as the most problematic state. After we returned to the White House, individuals started to make suggestions about how to handle this or that problem. We had developed a small kiddie [SP] out of some HEW flexible funds so I could say to the committee members that if they judged that funds were needed for minor expenditures, I could provide some money on a fast track basis. They liked that. It was gripping. And they left the office, Oval Office, truly inspired by the President. I remember Pat Moynihan, he was blown away. He shook his head. We went through much the same process with representatives of five other states. We felt we were on a roll. The last state was Louisiana. The schools would soon open. Our meetings were going so well that I and the people working with me suggested to the president that we hold this final meeting in New Orleans. We would go to the South where the action would take place. I would do my part in the morning with the Louisiana delegation. He would fly down from Washington to do his part at the end of the morning meeting. Then in the afternoon, we would invite the co-chairman from each of the seven states to join the president for an overall discussion of the school openings. The president looked at me. I felt he’d already made his decision to go and he didn’t need any arguments from me, but I said what was obvious. “I can’t predict what will happen. The vice president may very well be right about violence, but you’re the president of the whole country. You’ve seen some very reasonable and strong people come up here. You’ve met with them and had a big impact on them. We should do everything we can to see that the schools open and operate peacefully and well.” The president decided to go ahead. And so on August 14th, 1970, he went to New Orleans. We took a recess. I went out and met the president, Agnew’s views at the back of my mind. “Mr. President,” I told him, “I haven’t got the group quite where I usually have them. I’m afraid you’re gonna have to finish the job yourself.” The president came in. He listened. He talked. He emphasized the importance of having the schools open peacefully. “Remember,” he said, “If there are problems, the children are the ones who will suffer.” He raised their sights. He brought them all on board. Phew. That afternoon, we had our meeting with the co-chairmen from the seven states. The meeting was highly publicized throughout the south. President Nixon talked eloquently about the importance of what was going to happen and the stake that everyone had in seeing it go smoothly. There were strong pledges of cooperation from whites and blacks alike, a sense of determination and a joint compelling enterprise filled the room. At the end of the meeting, President Nixon went before the television cameras with a co-chairman standing with him to drive his message home. “The highest court,” this is President Nixon speaking, “The highest court of the land has spoken. Unitary school system must replace the dual school system throughout the United States. If the widely predicted difficulties take place, those who will suffer will be primarily the next generation, the students, the children, and the school district involved. We believe all of us, in law, in order, in justice, we believe in enforcing the law. But I also believe that leadership in an instance like this requires some preventive action. A “New York Times” columnist Tom Wicker wrote reflectively in 1991. He took the trouble to look into this. “There is no doubt about it, the Nixon administration accomplished more in 1970 to desegregate southern school systems than has been done in the 16 previous years or probably since. There’s no doubt either that it was Richard Nixon personally, who conceived, orchestrated, and led the administration’s desegregation effort, holding it uncertain before he finally asserted strong control. That effort resulted in probably the outstanding domestic achievement of his administration.” Well, here are three examples of President Nixon in action. Restore the health of the private, collective bargaining system, create a volunteer armed force, end the dual school system in the south. Not a bad day’s worth, Mr. President. Thank you.